Successfully Added Stellar - Tiny Multifunctional DVR (High Definition, 30 FPS) to your Shopping Cart. Stellar – Tiny Multifunctional DVR (High Definition, 30 FPS): the World’s Smallest DVR just gets even more awesome! Even Better Video Quality: As an upgrade of your favorite CVFR-DV54, the Stellar records at a higher resolution of 1280 x 960 pixels. The HD videos are so crisp, colorful, and vivid, that you will sometimes feel as if you are actually there! New Look: The new design removes the four buttons around the screen and replaces them with touchscreen function. This gives the screen a cleaner look. And with a silver rim, the camera looks more sleek and sophisticated. Versatile As Always: With enriched features, the Stellar can excel your every need as your Car DVR, webcam, or camera. Car DVR: With a car mounting kit, the Stellar can be easily attached to your car windshield and record up to two hour of videos on one charge! 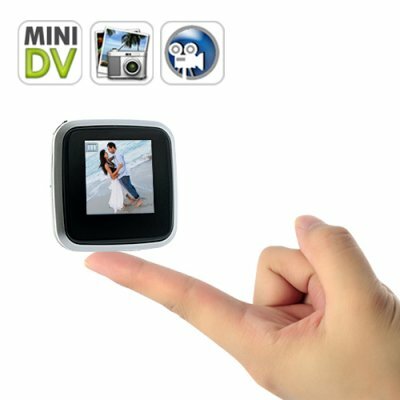 Webcam: Just install the driver on your computer and start using this World’s Smallest Digital Video Recorder to have a high resolution of 1280x960 and an incredible 30fps crystal clear video chat. Camera: With both audio and video capturing ability and a small inconspicuous size, this is a perfect device to keeping an eye on sensitive areas, as well as an inexpensive and easy to set up security system anyone can use on their own. Press upper area of the screen to zoom in, and lower area to zoom out. Press right side of the screen to turn on/off the camera.